"After finishing Speak, I saw a wonderful quote from Emily St. John Mandel in support of the book. 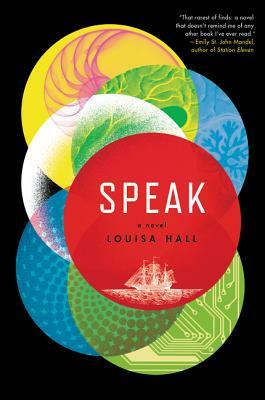 Mandel's novel Station Eleven is one of my favorite books from last year, and Speak is my new favorite this year. The stories have little in common but feel similar in that each uniquely examines what it means to be human. From a Puritan girl in the seventeenth century to Alan Turing's first inklings about artificial intelligence; through the creation of the first computer programs to a grim, not-to-distant future, I was captivated by the story's flow, both through history and consciousness. It is an amazing novel which speaks in voices so different and real, it was a pleasure to read each one."